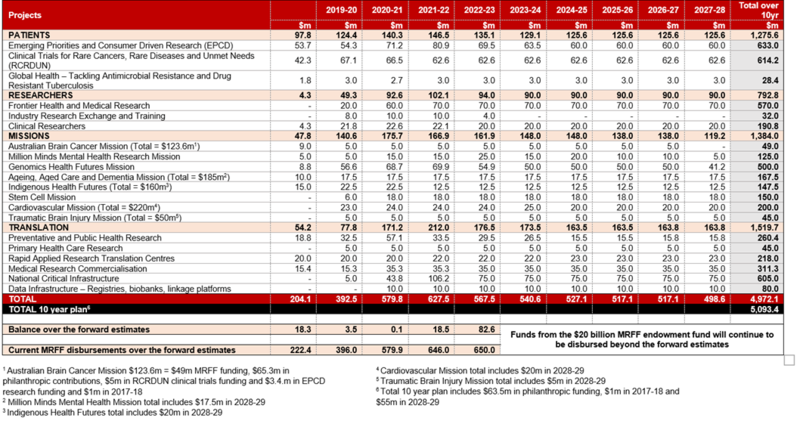 AAMRI > News & Events > AAMRI News > 2019-20 Federal Budget – what’s in it for medical research? It was another interesting night for medical research in the Federal Budget. We’ve been through the Budget papers and dug out all the announcements we can find relating to medical research. 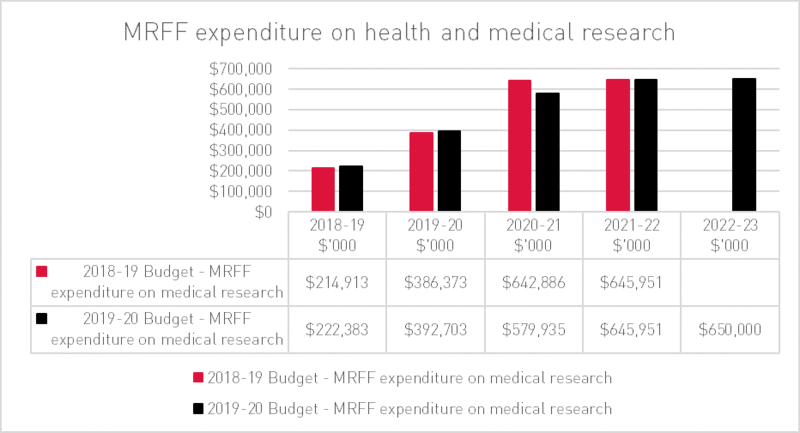 The highlight of the Federal Budget was the renewed commitment to get the Medical Research Future Fund (MRFF) fully capitalised over the next two years. This will see the MRFF reach a total balance of over $20 billion, and will be the largest medical research sovereign wealth in the world. A ten year investment plan for the MRFF was also announced. 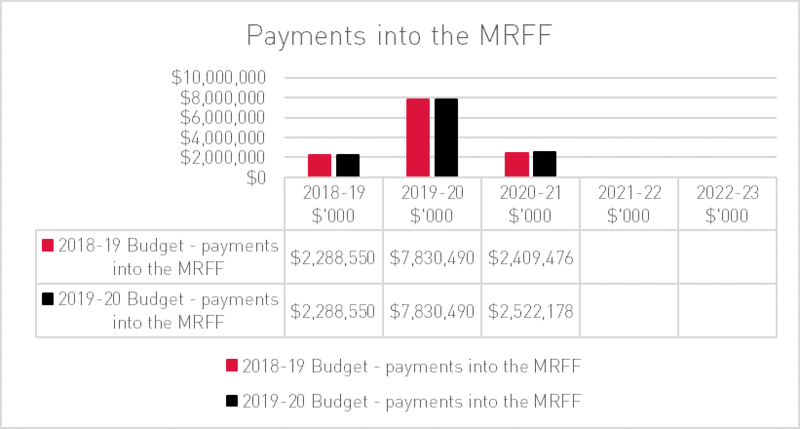 The plan outlines the funding profile for all the MRFF initiatives over the next decade, with some of the existing initiatives seeing their funding extended. A ten year investment plan for the MRFF has been released, outlining the all the major areas the MRFF will invest in over the coming decade. There are no significant changes to funding for the National Health and Medical Research Council and the Australian Research Council. Funding for a dementia centre of excellence at Curtin University has been announced. Funding will also be provided for a regional, rural and remote medical research institute to be established in Orange. Under the banner of the ‘Community Health and Hospitals Program’ significant funding will be provided for a Comprehensive Children’s Cancer Centre at Sydney Hospital, a Centre of Excellence in Cellular Immunotherapy in Victoria, and for James Cook University to be a centre of excellence in tropical medicine. Support for diabetes research will be provided to the Juvenile Diabetes Research Foundation, as well as some specific funding earmarked through the MRFF. The Lowitja Institute has been refunded. 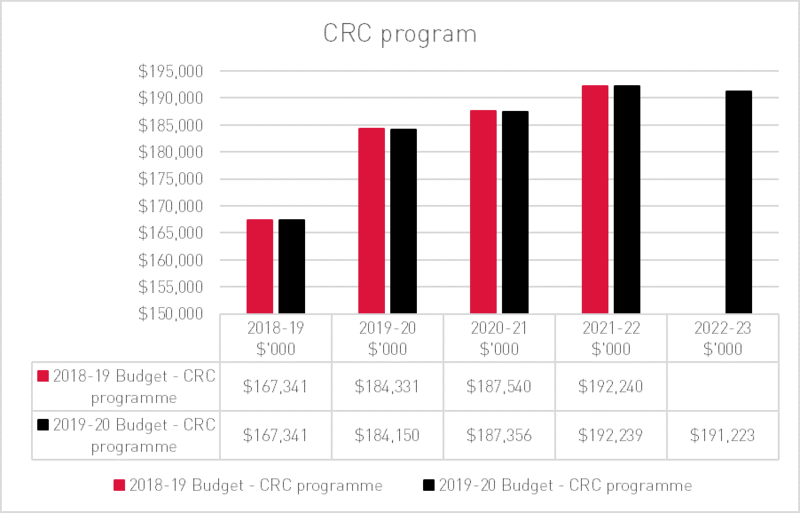 There are no significant changes to funding for NCRIS and the CRC program. 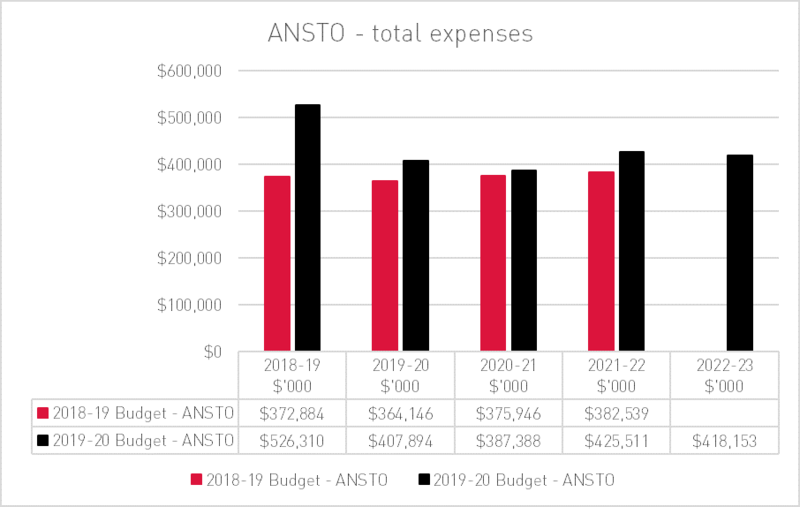 Funding for ANSTO is expected to rise more quickly than previously forecast. 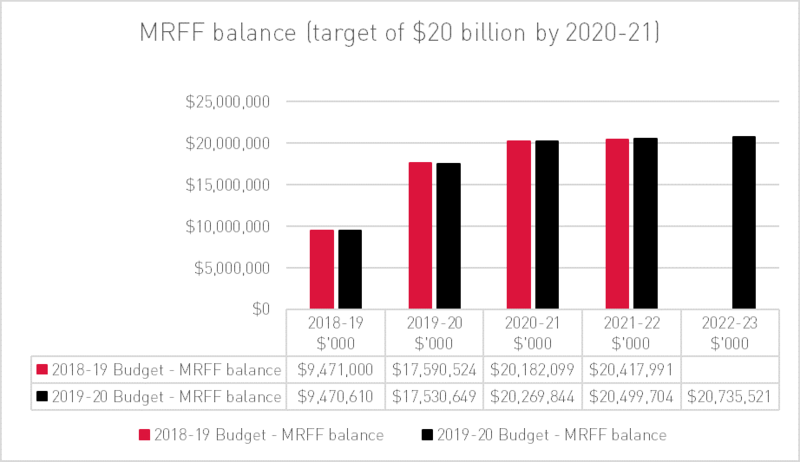 There are no changes to the planned capitalisation of the Medical Research Future Fund (MRFF), with the Government continuing to commit to fully fund the MRFF to $20 billion by 2020-21. The following charts show expected payments into the fund, along with the total balance of the fund. Project expenditure on medical research is broadly in line with previous budget estimates. The Government has released a 10 year plan for the Medical Research Future Fund, outlining the different projects set to receive investment. The projects are broken down into four areas: patients, researchers, missions and translation, representing a total of $5 billion of investment in medical research. A breakdown of the annual investments in each of the initiatives is provided below. A new Health and Medical Research Office will be established within the Department of Health to oversee the MRFF. The office will provide strategic and policy support for the MRFF and will be headed by a CEO. Funding of $20 million over four years has been set aside for this initiative. 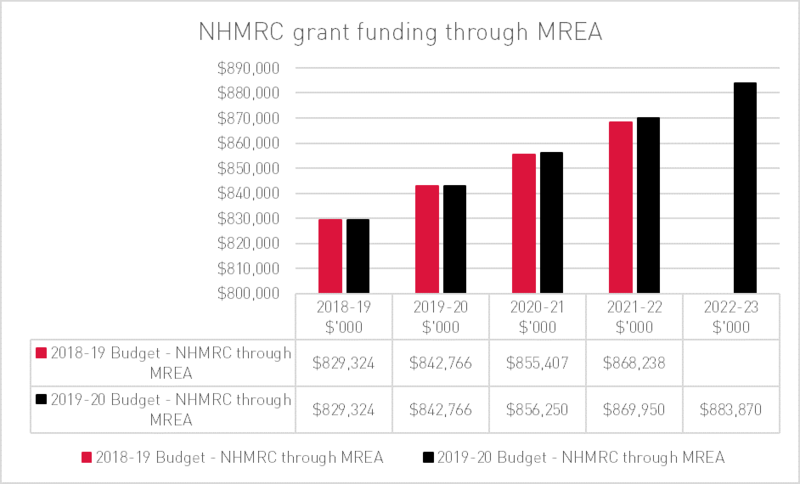 There were no significant changes to medical research funding through the NHMRC Medical Research Endowment Account (MREA). Slight inflationary increases are provided for in the coming years. 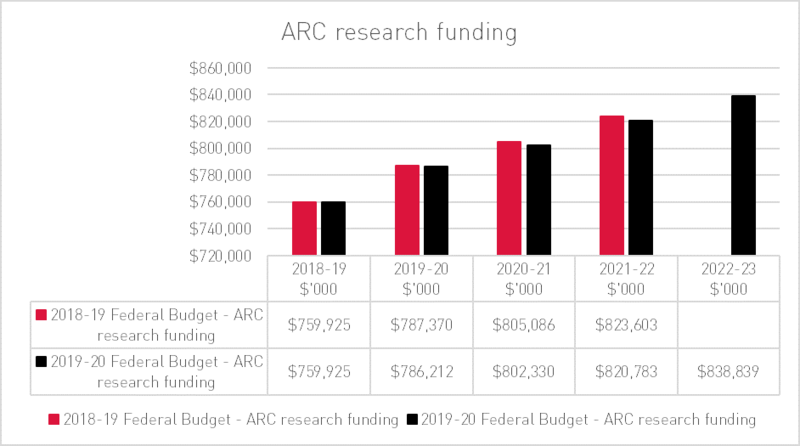 There are no significant changes to Australian Research Council (ARC) funding compared to the previous budget. The following table shows expenditure on research through the Discovery and Linkage programs. The Government will provide $3.4 million over four years from 2020-21 for women in STEM programs. The funding will support an extension of SAGE for an additional three years, and a digital content National Awareness Raising Initiative, led by the Women in STEM Ambassador. $18 million for the Charles Sturt and Western Sydney Universities to establish the Institute for Regional, Rural and Remote Health and Medical Research Institute in Orange, NSW. $100 million for a Comprehensive Children’s Cancer Centre at Sydney Hospital, Randwick, New South Wales. $80 million to establish a Centre of Excellence in Cellular Immunotherapy in Victoria, including for manufacturing of cellular immunotherapies for Australia and the Asia-Pacific. $60 million to support the James Cook University Tropical Enterprise Centre in Queensland to become a centre of excellence in tropical medicine. The Government will provide $2.0 million in 2018-19 to the Channel Nine Queensland Telethon. The telethon raises funding for medical research, new medical equipment and provides support services for families. $6.0 million over four years from 2019-20 for the Juvenile Diabetes Research Foundation. $25.0 million over five years from 2019-20 for the Juvenile Diabetes Research Foundation to advance its Type 1 Diabetes Clinical Research Network. $25.0 million from the MRFF for targeted diabetes research under the broader $125.0 million MRFF Targeted Translation Research Accelerator initiative. The Government will provide $10 million over three years to the Lowitja Institute, Australia’s National Institute for Aboriginal and Torres Strait Islander Health Research, to continue their work to improve the health and wellbeing of Aboriginal and Torres Strait Islander peoples through research. The Government will provide $56.4 million over three years from 2019-20 (including $31.9 million in capital funding) to ANSTO to support nuclear medicine and nuclear decommissioning activities and asset management. The Government is providing $7 million for research aimed at developing improved models of care for people living with brain disorders. This clinical and research translation program will be led by Mindgardens Neuroscience Network. The Mindgardens Neuroscience Network comprises AAMRI members the Black Dog Institute, Neuroscience Research Australia, as well as Eastern Sydney Local Health District and UNSW Sydney. 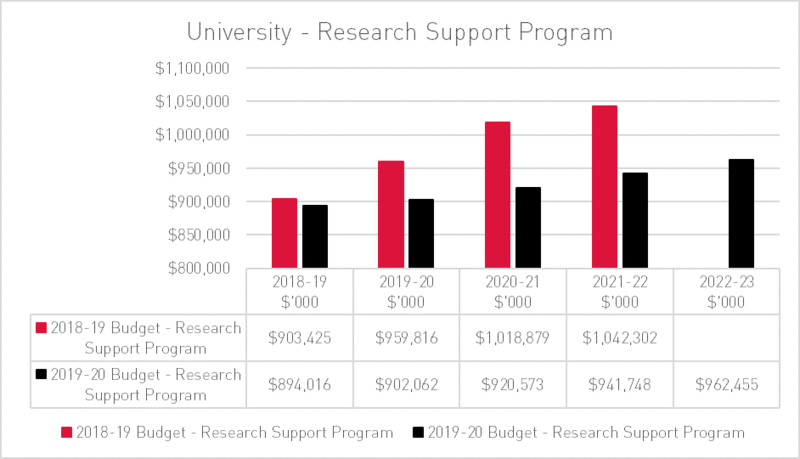 The Research Support Program helps cover the systemic costs of undertaking research for universities. 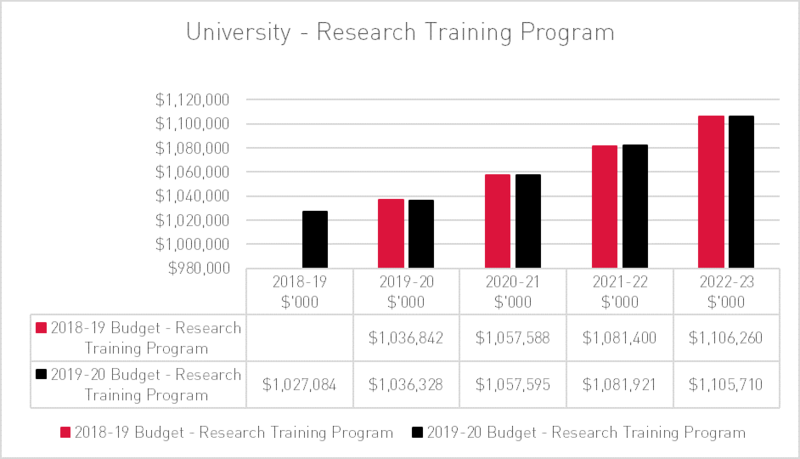 As announced earlier this year funding for university research block grants will grow much more slowly than forecast in the previous Budget. The Research Training Program provides support for higher degree research students. There are no significant changes in funding for this program. 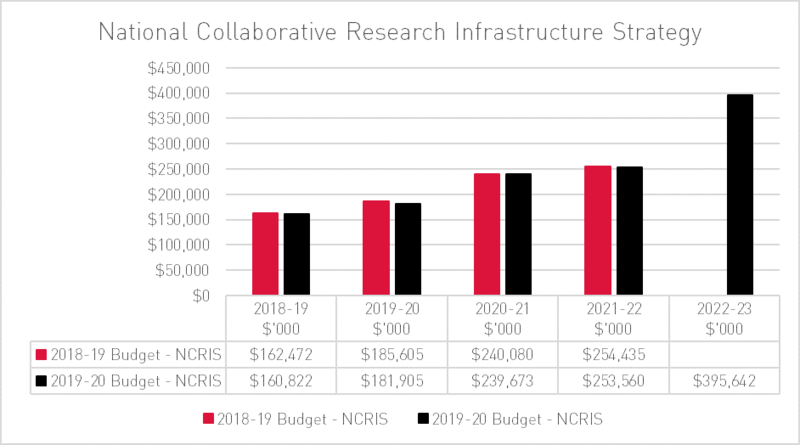 Funding for research infrastructure continues as forecast in the previous budget, but there will be a significant increase in funding in 2022-23. There are no significant changes in the funding profile for the Cooperative Research Centre program. Expenditure on scientific programs was higher in 2018-19 than previously planned. Expenditure over the forward estimates will be a little higher than forecast in the previous budget.